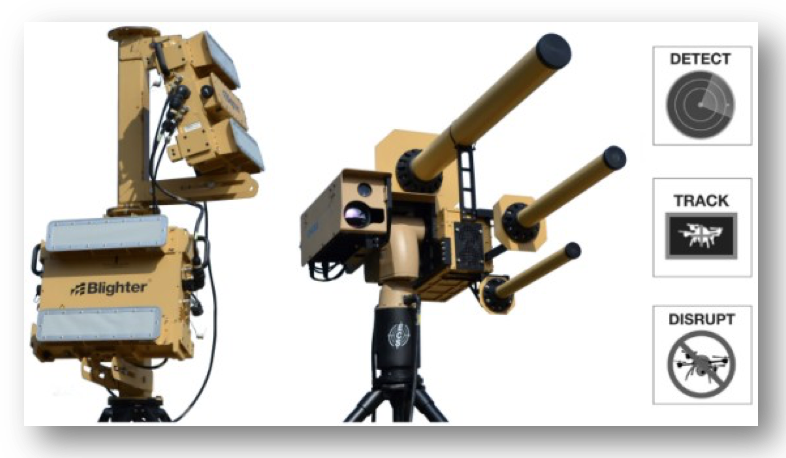 The AUDS system is designed for countering drones or remotely piloted aircraft systems (RPAS) in remote border sites or urban areas. It can be operated from fixed locations and from mobile platforms. It has been developed and manufactured in the UK using British technology and a production version is available now at COTS prices starting at less than £800k. The AUDS Team brings together three British companies, each with the unique capabilities required to create an effective counter UAV system. Blighter’s A400 series air security radars are able to detect small UAVs in all weather conditions, 24 hours a day. The Chess Dynamics Hawkeye EO/IR camera system, with state-of-the-art video tracking technology, is able to track the UAV and, combined with radar target information, classify the target. The operator is then able to make a timely and informed decision to use the Enterprise Control Systems (‘ECS’), smart RF inhibitor to selectively interfere with the C2 channels on the UAV allowing the system to disrupt the UAV’s mission. The AUDS system is designed to combat the growing threat of malicious micro, mini and larger unmanned aerial vehicles (UAV) or drones. The system can detect a drone five miles (8km) away using electronic scanning radar, track it using infrared and daylight cameras and specialist software before disrupting the flight using an inhibitor to block the radio signals that control it. The Anti-UAV Defense System (AUDS) integrates the Blighter A400 Series Ku band electronic scanning air security radar, Chess Dynamics’ stabilised electro-optic director, infrared and daylight cameras and target tracking software, and a directional radio frequency (RF) inhibitor from Enterprise Control Systems to detect, track, classify, disrupt and neutralise UAVs. The AUDS system is even effective against so-called Group 1 micro UAVs at ranges of up to 2km and Group 1 miniUAVs at ranges of several kms. According to the AUDS team, the speed with which new features have been added to the system since the launch in May, demonstrates both the agility and flexibility of the trio of specialist companies. The quad band inhibitor enables the AUDS operator to disrupt the different licensed telemetry bands of commercial drones no matter where in the world they are designed and licensed for use. For example, both the 433 and 915 MHz frequencies commonly used by unmanned aircraft systems (UAS) can be disrupted as can the 2.4 GHz control band and the global satellite (GNSS) bands. The new optical disruptor is yet another tool available to the AUDS operator. This feature can be utilised for both pointing at a drone for identification purposes and disrupting the automatic gain control settings in the drone’s camera system such that the operator loses visibility. The optical disruptor can also provide a very precise identification of known UAV launch activity to any ground forces. Other improvements in the production version of the AUDS system include a new positioner for the camera. And, following a whole series of trials in a variety of different terrains, the team has modularised the system to reduce the single lift weight down to 25kg. All the different elements – radar, cameras, and RF inhibitor – now clip together to form a complete system.